HE new architecture, in anything approaching the purity of the Italian style, took root in England as the accepted style for ordinary buildings later than in any of the countries [France, Germany, and Italy] I have already spoken of. The English are a conservative people. The native style was strong and vigorous, sensible and suited to domestic wants, understood by the builders and liked by the people. They were proud of its achievements in buildings like King's College Chapel at Cambridge, and of the new magnificence which it had added to almost every church in the country, and they had no thought of such revolutionary change in their habits as the adoption of the new style would have involved. Till our own day, when the Great Exhibition of 1851 destroyed the last remnants of traditional art remaining in England, it survived still in some remote parts as the style of village tradesmen, for unimportant buildings such as cottages or barns. Yet there exist still in England pure examples of Classic art, dating from an earlier period than any such in Germany [286/287] or even in France. The tomb of Henry VII. in his chapel at Westminster, dating from the first years of his successor's reign which hegan in 1509, is the work of the Italian Torrigiano, and hears no trace of English Gothic influence. In the Rolls Chapel, Chancery Lane, there is a monument hy the same artist to Dr. John Young, Master of the Rolls, who preceded Sir Thomas More in that office. The ornamental parts of the stained-glass windows of King's College Chapel at Cambridge, are Classic in design, but these also are foreign importations, and had no influence on the general architecture. The fittings of the chapel, the altar-screen and stalls are also Classic; but the old tradition of English art was too strong for such small and isolated examples to make any impression on it. They remained mere foreign importations. By the quarrel between the King and the Pope in 1533, when Cranmer pronounced the divorce of the marriage between Henry and Catherine, Italian ideas in this as in other spheres were deprived in England, as in the Protestant parts of Germany, of the influence they would otherwise have had. The Classic style was first introduced into the architectural construction of buildings, apart from mere decorative adjuncts, in Elizabeth's reign (1558-1603), in Longleat in Wiltshire; it is said, by John of Padua, between 1567 and 1597. The accompanying view of this house (fig. 93) I copied from an old print, for the purpose of showing the arrangement of the gardens, which are now destroyed. It does not accurately represent the present condition of the house. The square projecting bays are in reality wider and flatter than shown; their cornices are of pure Classic contour, without the corbels shown in the drawing, and the pilasters are broader and shorter in proportion. The aprons under the windows are different in form. The great door as it exists now is more purely Classic in character. It has only [287/288] one column on each side, a broken Italian pediment the full width of the door, with a shield in the centre; but this looks like a later alteration made when the terrace leading to it was destroyed to give space for a carriage-drive to the door, and the present great flight of steps made leading directly to it. 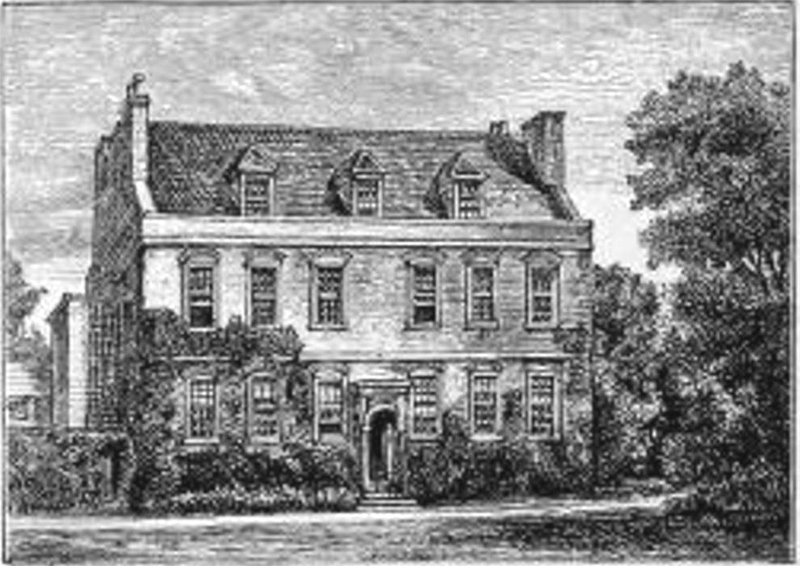 In its essential features the building is late English Gothic, ornamented with a few Classic details, and so little impression had these made, and so thoroughly did the art of the country remain Gothic in principle that this drawing of a much later date Gothicises even its Classic features. To the influence of an Italian designer we probably owe the pilasters of the bays, with their entablature and cornice, which are designed in the actual building in excellent Classic proportions. In the spaces left between these are inserted, instead of the round arch of Classic architecture, English mullioned and transomed windows, obviously not due to the suggestion of an Italian artist, but to the English master mason of the period. This seems a scarcely adequate result for the employment of an artist specially brought from Italy. But in England as in France the Italian artists found a sphere for their art in the fittings and sculpture of the internal decorations. The external building was wisely left to the skill of the native workmen, who knew how to build to suit English habits and the English climate. In the time of King James the authority of the Classic orders had become an accepted article of faith, and a part of the ordinary building style of the country. This was due in some degree to the influence of the new literature. The Classic orders were part of the new light which the Renaissance brought to mankind. The treatise of Vitruvius became the Bible of architecture. In it, and other books, and in buildings abroad, the new art was studied by many gentlemen, who doubtless tried, as country gentlemen some [288/289] times try now, to get their workmen to carry out their ideas. A great building like Longleat would train many workmen, who, regarding what they had there learned as the newest light on art, would, repeat it on the first opportunity. These new ideas were adopted, as new or foreign words are taken into a language, of which the construction remains unchanged. So the principles and construction of the style remained English. The workmen accepted the Classic features of columns, entablature, and mouldings, but they did not catch the Classic spirit or ideas. The process of development was irregular, being dependent on the knowledge of the new architecture which each designer happened to have attained, so that the greater or less purity of the Classic details in a building is no sure test of its date. The result in the Elizabethan and Jacobean styles is very different from pure Classic, and was shocking to those who regarded the five orders as the standard of truth. When Classic architecture became generally known and acknowledged in authority, the new style was ridiculed as King James' Gothic. But it was the natural development of the circumstances, and is fairly entitled to be called a national style. It was full of the quirks and fancies, which, as the iterature of the time shows, occupied the minds of people n that generation. It delighted in abundance of window ight, as a reaction against the small narrow windows, itherto rendered necessary by the conditions of defence, if the builders wished to reproduce in their dwellings be new intellectual light. The drawings (figs. 94 and 95), for which I am indebted i the kindness of the proprietors of 'The Graphic,' of an interior in Lime Street, pulled down by the Fishmongers' Company in 1876, show a fair example of the new style vhich was formed by the union of the Classic ideas with the Id native architecture. The screen between the two rooms [288/289] (fig. 94) is according to the common Classic recipe the round arch inserted between the columns and lintel, but the workman has carved it out in his own way and has put his own ideas into it, as in the consoles of the frieze, which are after no Classic model, but of English growth. But there is no Classic authority for the design of the great chimney-piece (fig. 95). Classic columns and mouldings are used, but instead of the Classic principle of column resting upon column, massive below and getting lighter as it rises, the design springs upwards in great corbels, and the two columns in the upper part are supported, and supported without any sense of weakness, by the single one below. This lower column is of a form for which there is no Classic authority. Instead of its weight pressing down on the ground it seems to spring from it. The form is similar to that of a baluster. It occurs in French architecture, but it is a special note of the Elizabethan and Jacobean styles. Classic architecture in anything like purity of style was first introduced into England by Inigo Jones. An excellent life of him, which by careful research brings out many new facts, was published in 1848 by the Shakespeare Society, written by their Secretary, Mr. Peter Cunningham. From this I shall state briefly the main facts of his career as an architect. He was born in 1573, the son of Inigo Jones, Clothworker, living in the parish of St. Bartholomew-the-less, in West Smithfield, London. His father (a native, it is thought, of Wales) was badly off when Jones was a lad of sixteen, as there is record that he had difficulty in paying a debt of 80. He died in 1597, when Inigo was in his twenty-fourth year, leaving debts, but apparently little property. Inigo, it is said, had been bound apprentice to a joiner Ben Jonson ridiculed him as a joiner in any case [1 The two arches in the screen were not of the same date, the one nearer the chimney-piece was a later addition, probably about Queen Anne's time. Its detail was more Classical than the earlier arch.] [294/295] no bad training for an architect. He was early distinguished, his pupil Webb tells us, for his skill in drawing and designing and in landscape painting. He went to Italy w hile young, but at what time is uncertain. " Being naturally inclined," he says in his book on Stonehenge, "in my younger years to study the arts of design, I passed into foreign parts to converse with the great masters thereof in Italy, where I applied myself to search out the ruins of those ancient buildings which, in despite of time itself and violence of barbarians, are yet remaining. Having satisfied myself in these, and returning to my native country, I applied my mind more particularly to architecture." Christianus IV., King of Denmark, Webb tells us, sent for him out of Italy, where, especially at Venice, he had resided many years. His stay in Denmark, Webb says, was long. In 1604-5. when in his thirty-second year, he had returned to England, where he was employed by the Queen of James [., Anne of Denmark, the sister of Christianus, along with Ben Jonson, to produce a Masque at the Court at Whitehall. During the succeeding years there are records of his being occasionally similarly employed, his share in the work being to design the scenery and dresses. Drawings still exist of the figures and characters which he prepared for these occasions. In 1610, Prince Henry appointed him Surveyor of Works in his newly established household, in which year he employed him in devising the scenery of a masque. He held this office till the Prince's death in 1612, when he went again into Italy, as we know from an entry in his copy of 'Palladio,' dated "Vicenza, Mundaie the 23rd of September, 1613." Entries in his sketch-books show that he was at Rome, Naples, and Vicenza in 1614. In 1615 he returned to England to take possession of the office of Surveyor of the Works, the reversion of which the King had promised him. The office gave him sufficient employment in superintending [295/296] the repairs of the King's numerous manor-houses and palaces, in arranging for royal progresses, and occasionally in devising scenes and machinery for masques and entertainments at Court, which were the occasion of a deadly quarrel between him and Ben Jonson. 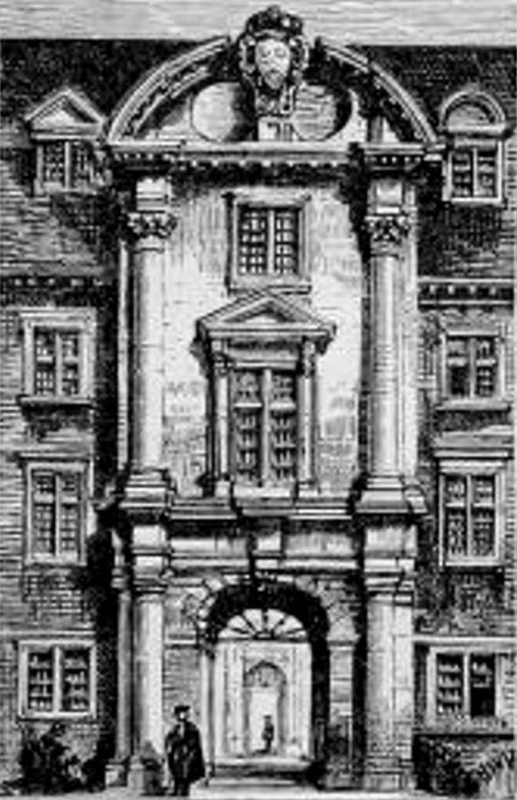 In January 1629, the old Banqueting-house at Whitehall was burnt down, and Jones was commissioned to build a new one, the first stone of which was laid in June of the same year, and the building finished in March 1622. By an account preserved in the Audit Office, it appears that the basement was of Oxfordshire stone, cut into rustick on the outside; the upper part of Northamptonshire stone, and the balusters of Portland. As the whole of the present building is of Portland stone, it must have been refhced at a later period. In 1620 he received the King's commands to investigate Stonehenge. From " some few undigested notes," which he had left, Webb published a treatise which declared that Stonehenge was a temple of the Tuscan order, raised by the Romans, and consecrated to the god Coalus, the origin of all things; an idea possibly suggested to suit the views of " the wisest fool in Europe." 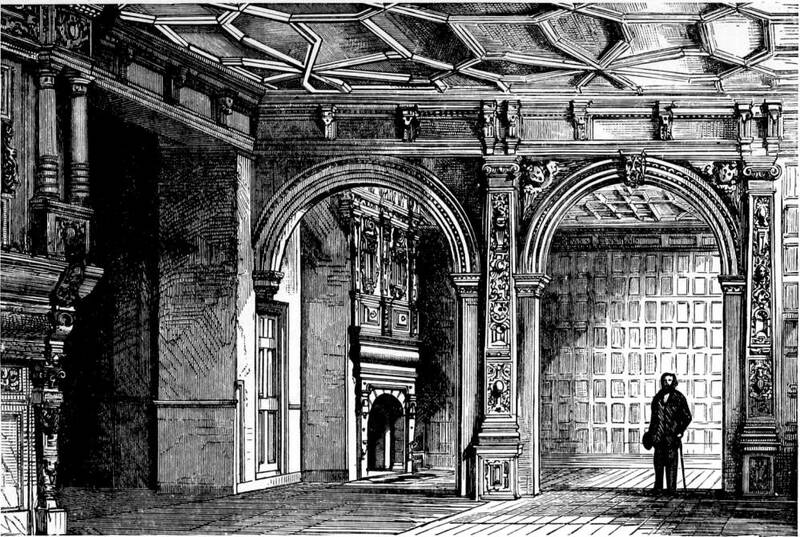 In 1618 he commenced the chapel at Lincoln's Inn, which was consecrated in 1623. The cloisters under it were intended as a place for the lawyers to meet their clients. This work is specially interesting, as showing the hold the old style still had, and the architect's knowledge of it. Notwithstanding its Doric columns and pilasters, from which the Gothic arches spring, it is able work. There was a rumour, I hope unfounded, that the Benchers actually proposed to destroy this piece of history, by "restoring" the chapel into correct Gothic. Figure 96. York Gate, a landing-place on the Thames. His next important works were the great west portico of old St. Paul's, and the Queen's house at Greenwich. St. Paul's was in a state of decay; the King and Laud wished him to rebuild it completely, and his portico was intended as an instalment of the new building. 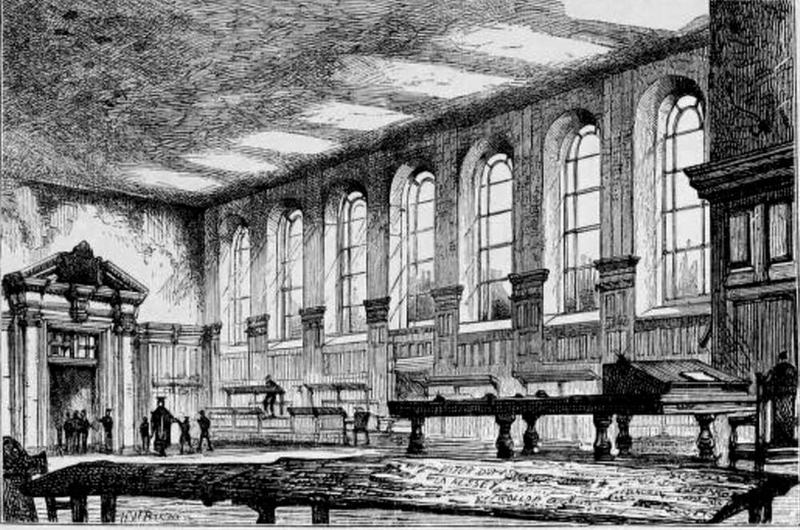 The nave of old St. Paul's had been long used as a lounge, for gossiping, for servants seeking places, and for people unable to afford a dinner, who were said to dine with Duke Humphrey, believed to have been buried there, though his tomb has since been identified at St. Albans. 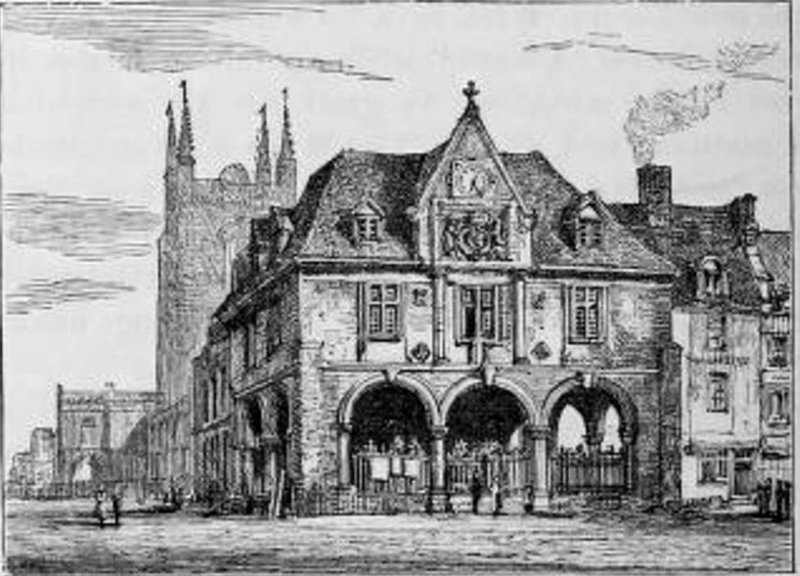 The new portico was intended to provide this public accommodation outside the church; arid, to make room for it, Jones removed the Church of St. Gregory, which stood in front of it, in a somewhat high-handed manner, for which he had afterwards to answer. The Queen's house at Greenwich was begun by Anne of Denmark, and completed by Henrietta Maria, whose name, and the date 1635, the period of its completion, are still on [299/300] of the building. It is the central portion of the hospital, now the naval school. The present west side of the great square was built by Webb for Charles II., it is said from Jones' design. 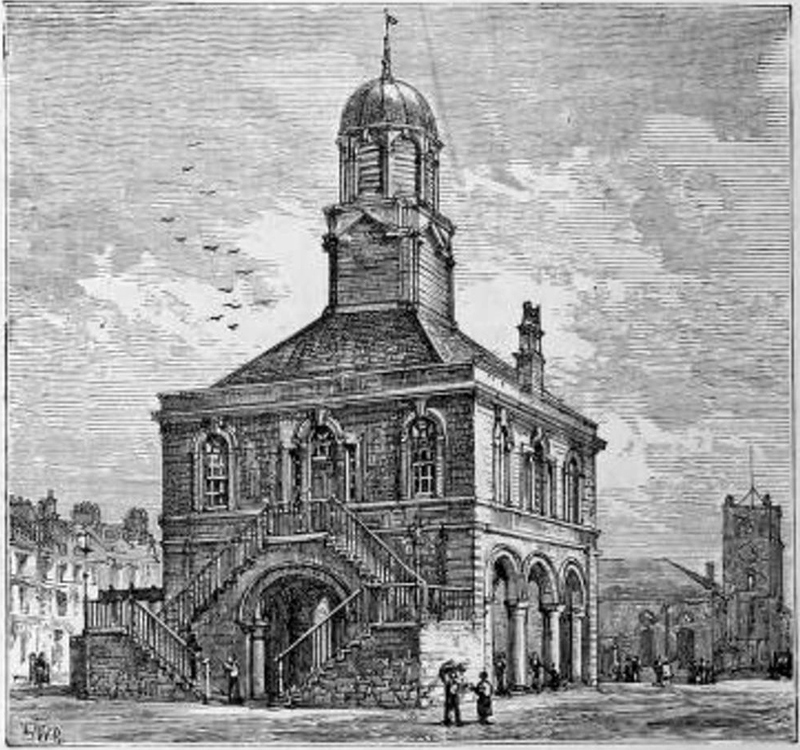 Church of St. Paul's in Covent Garden as reconstructed by Hardwick. In 1631 he commenced the Church of St. Paul's in Covent Garden, which was not finished till 1638. As he designed it it was of brick with a red tile roof, the columns of the portico and other parts of stone. Lord Burlington repaired it with care and reverence in 1727; and in 1795, on its total destruction by fire, it was rebuilt of stone, by the elder Hardwick, on the plan and proportions of the original structure. The piazza of Covent Garden was from his design originally with stone columns on a red brick wall. These have been covered with paint and plaster, and are now being removed. Few great architects have been so unlucky. Almoj nothing that he planned was finished, and his works have been altered or rebuilt. In 1642 the Civil War broke out and stopped all building. He joined the King's party he was a Roman Catholic, and was taken prisoner at the siege of Basing [Note: Carlyle's ' Cromwell,' vol. ii. p. 250, 2nd edition]. He died at Somerset House in June 1652, in his seventy-ninth year, and was buried beside his father and mother, in the church of St. Benet, Paul's Wharf. Inigo Jones fell on evil times for art. Its quiet music was drowned in the noise of battles and the strife of parties. The nation had more important things to attend to. Had the King, Charles I., had his way; had he been allowed scope for his artistic tastes, by the help of the foreign painters whose works he admired, and with the genius of Inigo Jones and the trained workmen of the time to carry out their ideas in splendid buildings and works of art, England might have become a home of the arts. But to give absolute power to the Crown was too high a price for Englishmen to pay for this. Whitehall would have been [300/301] one of the noblest palaces in Europe. Had it been built it would have settled for us, in a way we might have been proud of, the still unsettled question of Government buildings in Westminster, and would have given a higher tone to all the architecture of the country. There was skill in art, and an appreciation of it in the country at the time, sufficient to have realised a splendid palace both in details and decoration. But, seeing what its completion would have cost us politically, few Englishmen will regret that the conception was never realised. Is it too much to hope that the Government offices, which remain to be built, may have something of the beauty and refinement which Inigo Jones would have given us, with greater suitableness for our modern purposes than his great palace would have had? The troubles which prevented the building of Whitehall prevented the carrying out of architectural works throughout the country. In some few cases Inigo Jones' designs were carried out, but for the most part they exist only on paper. I have copied from the book of his designs published by Kent, the plans and elevation of a house for the Duke of Queensberry. 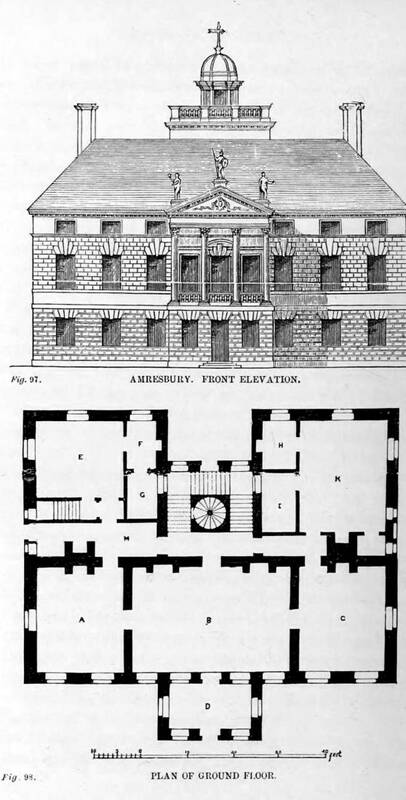 [Note: In Campbell's 'Vitruvius Britannicus' the same design is entitled Amresbury, Wiltshire.] Mr. Fergusson decides, from what he thinks the inferior merit of the design (figs. 97 and 99, pp. 304, 305), that it is not Jones', but probably Webb's. I do not pretend to the same insight, but it is historically interesting, because it illustrates what was, till the Gothic revival, the general type of English country mansions. The distinctive feature is the portico in front. For the next hundred years no gentleman's mansion was complete without a portico. It is true that this was an unmeaning decoration, the feature is beautiful in itself, and it had been worked out by successive refinements to a high degree of perfection, but its proper use and purpose was gone. It is a "survival,' [301/302] like what is said to occur in the animal kingdom, of organs now useless which had served necessary functions in other circumstances in an earlier stage of the animal's development. In this case the portico is utilised as a covered balcony from the great hall on the first floor (fig. 100), an expedient which has been repeated in the buildings of University College, in London, but with unhappy results in our climate, so far as comfort and convenience go. Almost every great mansion built in England in the last century had such a portico, blocking out the light from bedroom windows, and making the house look cold and damp. Yet undoubtedly it gives grandeur to the design. The back elevation in this design (fig. 99) is interesting, showing how a certain dignity of architectural effect can be produced by the simplest means without appearance of effort, for the position of the windows is determined, as may be seen by the plan, solely by the exigencies of the internal arrangement. The windows in the rooms E and K are kept in the centre, irrespective of any considerations of symmetry outside. Short square windows, as in this design, in the upper story, or attic, as it is architecturally called, continued long a feature of Classic houses in this country. The horizontal band which they make gives a Classical effect, which would be destroyed by breaking them up through the cornice into the roof; while to increase the height of the building so as to make these windows taller, would spoil its proportions. But to have bedrooms dark and ill-ventilated, from the top of the windows being halfway down the wall inside is, perhaps, too high a price to pay for architectural proportion. The practice of the French Kenaissance, of raising dormer windows above the line of the cornice, is more practical and better suited for our adoption. The designs of Inigo Jones thoroughly carry out the Classic principle of symmetry. It is a principle of all forms and types of architecture, as it is of animal organisation. It is essential to the highest dignity of great buildings, and it gives some even to small and simple ones. Among Jones' designs published by Kent there are some simple farmsteadings to which a really grand architectural effect is given by arranging the farm-buildings and enclosures with perfect symmetry on each side of the farmhouse. With our Gothic training we no longer consider symmetry essential, and think it even foolish to make the stables on one side of a house appear like a repetition of the kitchen offices on the other. The Gothic practice of allowing the internal arrangements to control the dispositions of the exterior architecture is a safer guide in house-planning, and more likely to attain satisfactory results in comfort and convenience than the Classic principle of making the internal arrangements fit in as best they may to the design of the outside. Figure 101. 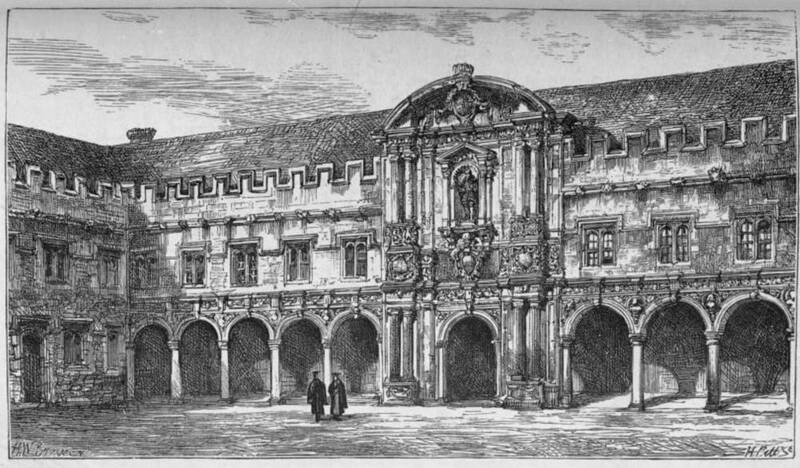 The inner court of St. John's College. It is true that, ten years earlier, he had designed the Gothic chapel of Lincoln's Inn. But that is not, like the Gothic parts of St. John's College, in the traditional style of the period, but an imitation of an older style mixed with correct Classic work. The upper story of St. John's, with its Perpendicular windows and cornice and battlements, is clearly the production of the workman of the period, following the traditional style. 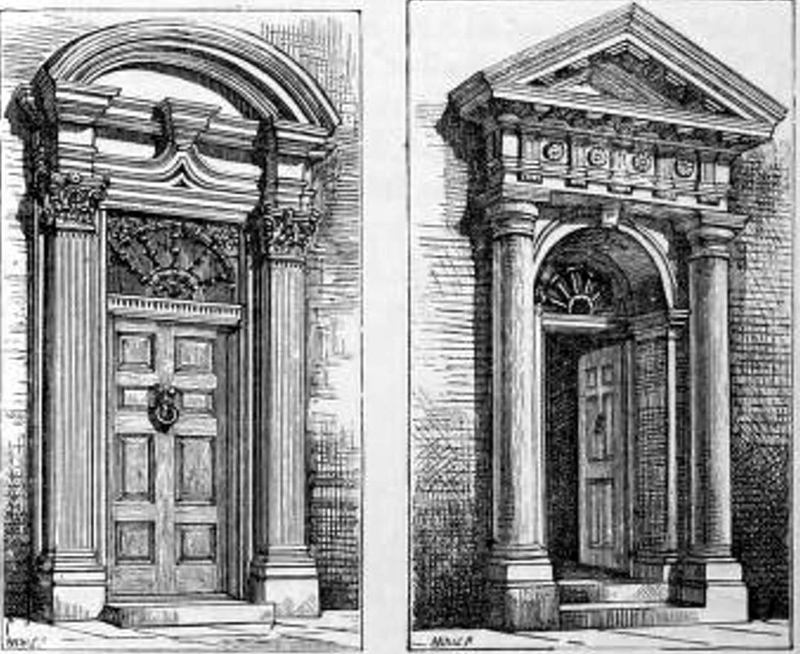 The general design of the Classic central porch and arcade, may have been suggested by him, but the details, though effective, are too far removed from Classical correctness and elegance to have been designed by the same hand which drew those of the buildings we know to be his, or by any one who had studied to good purpose in Italy. So long as - there was a living style of architecture, this is what would naturally happen. Every workman, without any drawings, knew how to cut the ordinary traditional mouldings, and it would have required much trouble an [310/311] constant personal supervision to make him work in any other way. In Wren's time there is a note of the change in the system of conducting architecture, by the architect supplying fullsize drawings for the details, instead of following the old system arid allowing the workmen to carry out these according to their traditions. 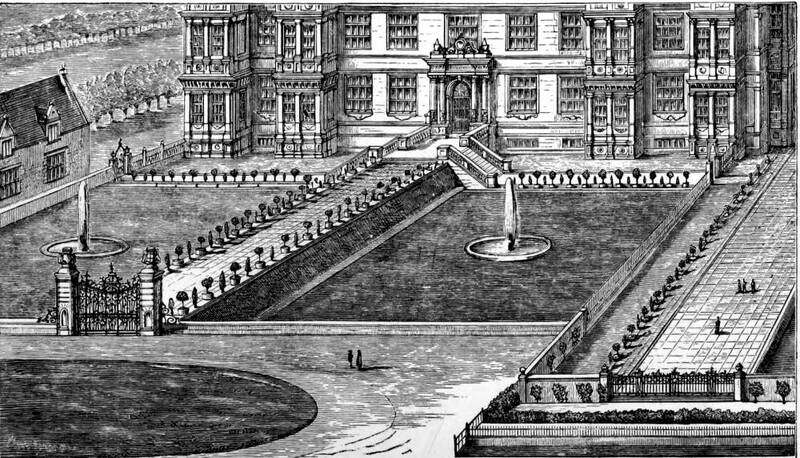 In a letter, quoted by Elmes in his life of Wren, to the authorities of Trinity College, Cambridge, in explanation of the plans he had submitted for the new library, Wren, says, "I suppose you have good masons, however, I would willingly take a farther pains to give all the mouldings in great, we are scrupulous in small matters; and, you must pardon us, the architects are as great pedants as critics or heralds." It almost seems as if Wren thought an apology needed for wishing to supply full-sized drawings, and thus interfering with the established custom of letting the masons cut the mouldings according to their own ideas. Inigo Jones is said to have designed Heriot's Hospital in Edinburgh, commenced in 1628, and it is by no means improbable. Cunningham, in his Life, says the internal fittings of the council room are in his manner. But judging from their style they appear to me of later date, of the time of Charles II. and Grinling Gibbons. 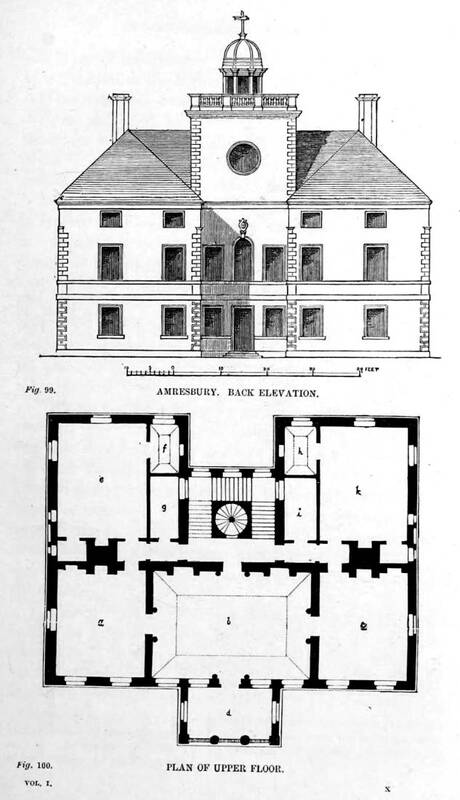 Jones may have furnished drawings for the general disposition and elevation of the buildings, but the Scotch workmen, who carried it out, have taken their own way, and built in their own traditional style. Figure 102. Market Cross, Peterborough. The general idea of the design of St. John's College, Oxford, is found elsewhere in England, as in the interesting little market cross of Peterborough (fig. 102). And it may have been a natural development of architecture in the circumstances of the times. For the arcades, the builders would see no difficulty in adopting the new ideas. They had merely to substitute a round arch for a Tudor arch; but [311/312] they might not see their way practically to manage the working of Classic windows without mullions. Just as GrotLic architects at present find it impossible to get their style thoroughly carried out, because people will not give up the sliding sash windows, to which they have been accustomed. During the Civil War and the Commonwealth (1642-60), there was little building. What was done was done in the traditional manner, people not troubling themselves with art or its professors. With the restoration of Charles II., and the return to power of an aristocracy, who considered themselves patrons of the arts, the interest in the new style revived. During his reign it became the accepted style of domestic architecture in London. In country parts, and occasionally at Oxford, long afterwards, the old style was still clung to. The Great Fire of London, in 1666, was a notable event in the history of architecture. It put an end to the building of wooden houses in the town, made brick the common building material of England, and spread [312/313] the fashion of Classic houses. It gave to Sir Christopher Wren one of the finest opportunities any architect has ever had, and he proved himself not unworthy of it. Wren, being delicate in health, was educated at home, excepting a short time at Westminster School. While a boy he was remarkable for his knowledge and invention in every branch of science. In his thirteenth year he invented a new mathematical instrument, which he dedicated to his father in a Latin address. In 1647, when he was fifteen, he was appointed demonstrating assistant by the Lecturer on Anatomy, at Surgeon's Hall. Anatomical drawings of his are extant, and he afterwards made discoveries in Anatomy. He made inventions in the use of the microscope, studied chemistry, and was an excellent mathematician. In his twenty-fifth year he was appointed Professor ot Astronomy at Gresham College, and afterwards Savilian [313/314] Professor of Astronomy at Oxford. He was an active member and an early president of the Royal Society, founded immediately after the Restoration, and he was constantly bringing before it new inventions of his own in all branches of human knowledge. Evelyn at Oxford, in 1654, says in his Diary: "After dinner I visited that miracle of a youth, Mr. Christopher Wren, nephew to the Bishop of Ely." In his Sculptura, he calls him " that rare and early prodigy of universal genius, Mr. Christopher Wren, our worthy and accomplished friend." Wren's first employment as an architect seems to have been in 1661, when the King, on his Restoration, sent for him from Oxford to assist Sir John Denham, Surveyor-General of His Majesty's Works, in the repairs of St. Paul's and Windsor Castle, and in building a new palace at Greenwich. Denham had been promised the reversion of the post by Charles I., for his loyalty rather than his capacity, of which Evelyn, who speaks somewhat contemptuously of his proposals for Greenwich Hospital (Diary, Oct. 19th, 1661), "though he had Mr. Webb, Inigo Jones' man to assist him," had a low opinion. There seems to be no record of how or where Wren got his practical knowledge of architecture. It was part of the polite learning of the day, and there is some evidence that his father, in 1634, designed a building for the Queen of Charles I., which apparently was not erected. It is not unreasonable to suppose that his father's interest in the art would give the son opportunities of which his enormous powers of acquisition and invention would make the most. In 1663 he was appointed assistant Surveyor-General, to do Denham's work; and, having refused an offer to go to Tangier to fortify it and construct the mole there, of which Pepys speaks so frequently in his Diary, he was appointed to superintend the repairs of St. Paul's. 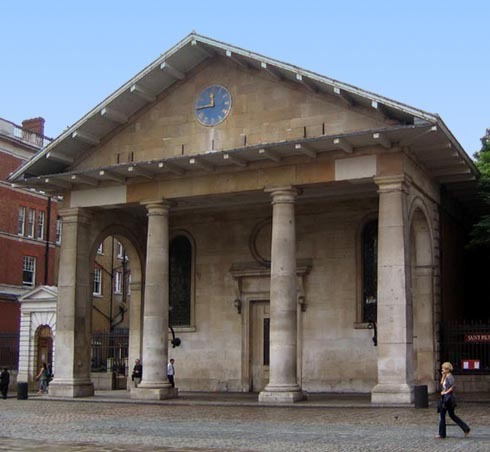 The church was [314/315] in a bad state, notwithstanding that Inigo Jones had cased a good part of it with Portland stone, and had rebuilt the north and south fronts, as well as the portico at the west end. 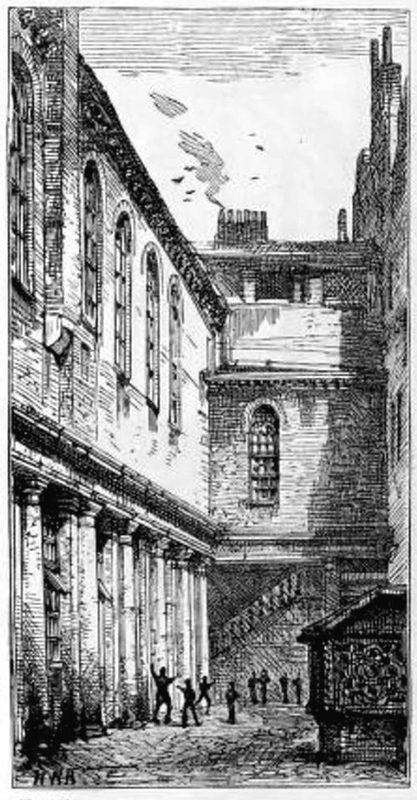 The roof, as appears from an account of Wren's, was ruinous, the pillars bent from their "ill-building with small rubbish stones and much mortar, and cased only with small stones." But his proposals for its repair would not commend themselves to us. He wished, "by cutting off the corners of the cross, to reduce the middle part into a spacious dome or rotunda, with a cupola or hemispherical roof, and upon the cupola (for the outward ornament) a lantern with a spring top to rise proportionally, though not to that unnecessary height of the former spire of timber and lead, burnt by lightning." "I would not," he continues, " persuade the tower to be pulled down at first, but the new work to be built round it, partly because the expectations of people are to be kept up; for many unbelievers would bewail the loss of old Paul's steeple, and despond if they did not see a hopeful successor rise in its stead." Not much, apparently, would have been left us of old St. Paul's, even without the Great Fire. In May, 1663, he exhibited a model for the Sheldonian Theatre at Oxford, not finished till 1669, the great roof of which of 90 feet span is still a marvel of construction; and in April the first stone was laid of the Chapel of Pembroke Hall, at Cambridge. 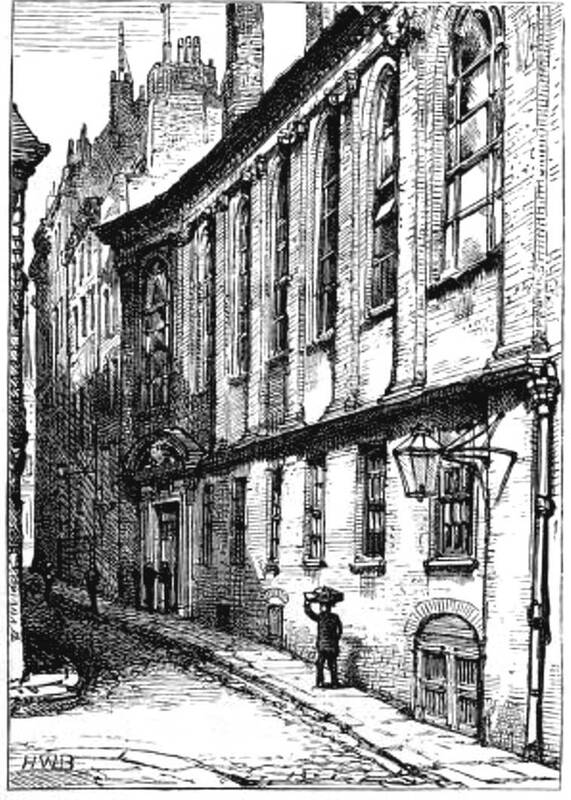 Though this was Wren's first building; I believe it was actually in contemplation by the college authorities to pull it down, as they have done the old hall, and other most interesting parts of the College, replacing them by modern work by Mr. Waterhouse. In the summer of 1665 he visited Paris, where he occupied himself, as he says in a letter to a friend, 1 "in surveying the most esteemed fabrics of the city and the country round" [Note: Parentalia, p. 261.] Versailles did not please him. "The women, as they make [315/316] here the language and fashions, and meddle with politics and philosophy, so they sway also in architecture; works of Filgrand and little knacks are in great vogue, but building certainly ought to have the attribute of eternal, and therefore the only thing incapable of new fashions." He seems unconscious that he was himself inventing new fashions in architecture. He had returned to London in March 1666. He does not seem to have thought of going to Italy. "The works going on in Paris," he says, "make a school of architecture the best probably at this day in Europe" (Parentalia, p. 261), On August 27, he made a survey of St. Paul's, with Evelyn and others of the commissioners, who reported in favor of replacing it by Wren's cupola, though some wished to reinstate the spire. On September 6th the Great Fire of London, which had been burning since September 2nd, settled the dispute by destroying St. Paul's. The remainder of Wren's life, for the next fifty-seven years, was spent in rebuilding what the fire had burnt. He proposed a "key" or embankment along the river, [316/317] from the Temple to the Tower, lined with the Halls of the City Companies the great lines of traffic widened and improved, with "piazzas" at their junctions. But the rights of individuals were too strong in England to make the scheme practicable. Attempts were still made to patch up old St. Paul's. In 1668 parts of it threatened to fall, and Wren was sent for in great haste from Oxford to advise; but it was not till 1675 that the plan of the new church was decided on, Wren appointed architect, and the work commenced. The first service in the new church was held in 1698, twenty-four years afterwards and in 1710, when Wren was in his seventy-eighth year, the top stone of the lantern was laid in his presence by his son. During this time, besides other works, he rebuilt fifty-two parish churches in London; many of the halls of the Merchant Companies; the hospitals at Greenwich and Chelsea; King William's Palace at Hampton Court; Marlborough House and a few private houses; among them the Earl of Orford's house at St. James's; the Duchess of Buckingham's, in St. James' Park, and the large mansion on the south side of Queen Square, Bloomsbury, for Lord Newcastle, the plans for which are among his drawings at All Souls' College, Oxford. In 1718, the Court influence round George I. deprived him of his post. In February 1723, he died at the age of ninety-one. Although Wren thought that "Building ought to have the attribute of eternal, and therefore the only thing incapable of new fashions," few architects have shown greater originality. The variety in the design of his steeples is marvellous. That of St. Magnus, London Bridge, built, according to Elmes, in Queen Anne's time in 1705, is a fair specimen of his style (fig. 103). With his age he accepted the authority of the Classic orders, but his irrepressible invention [317/318] made a new architecture out of them. His skill in construction made him equal to the most difficult problems; his fecundity of invention in art was governed by a sense of proportion and beauty. We laugh at his Gothic. We can copy better old Gothic mouldings, but his Gothic towers are admirable in outline, which unhappily our modern ones seldom are. His Classic mouldings are always excellent; full and flowing in their contours, without the delicacy of the Greek. Many of the forms which be used, as for example, his windows, are those of the French architecture of his day France, we saw, he thought the best school in Europe but instead of their sometimes feeble elegance, he imparted to them an English masculine vigour. Wren so trained a school of workmen that Classic became their traditional style, which they could carry out without drawings. This is the only practical method of producing art-workmen. The South Kensington system of trying to make each workman an artist, capable of invention, has hitherto produced only failure, and can never have any other result. The original inventors in any age I must always be few. To produce good architecture generally, their inventions should be learnt and thoroughly understood by ordinary builders and workmen, so that they become part of their traditions and habits. The old system of apprenticeship accomplished this. Failing this, we are dependent on the modern system of architects directing the building to its minutest details by means of drawings, which presupposes [323/324] that all architects are original inventors. If they .are, this age is richer in originality than any previous one. The condition of modern architecture does not bear out this supposition. Wren introduced Italians for sculpture and decoration, and developed a school of wood-carving under Grinling Gibbons. The stone carving at St. Paul's is the work of a school of carvers, admirable in its style, full and rich, without the perfection of line of the Italian, or the graceful delicacy of the French. In time the carving lost this fulness, in striving after elegance, and became, as in the Church of St. Mary-le-Strand, somewhat thin and weedy. The rich and splendid wood-carving was a special glory of the architecture of Wren's time. Grinling Gibbons was counted the best wood-carver of his day, though, as a part of architecture, his work seems to me too natural. Evelyn, then living at Deptford, discovered him . . . . In Wren's day Classic architecture became the vernacular of the country; the mode wbicb every workman understood, and in wbicb be naturally worked. Tbis result was caused partly by the abandonment of the old practice of building in wood and plaster, witb wbicb the Gothic modes of work were associated in England, from the exhaustion of the forests as well as the dread of fire; and partly from the new fashion, which had long been accepted by the rich and cultivated, descending in time to the people. Gothic buildings were still erected. Wren built many himself, the Tom tower at Christ Church, Oxford, and Gothic towers to churches; as did Hawksmoor after him. But these were conscious revivals to harmonise witb existing Gothic work, or to perpetuate a form which association had rendered dear. "Many unbelievers," as he said, " would bewail the loss of old Paul's steeple." But with these exceptions, which are of the kind that prove the rule, the architects and masons of the day all worked in the same style. "Where Gibber's brazen brainless brothers stand,"
was erected after the Union, as the supporters, representing the lion and unicorn, show. 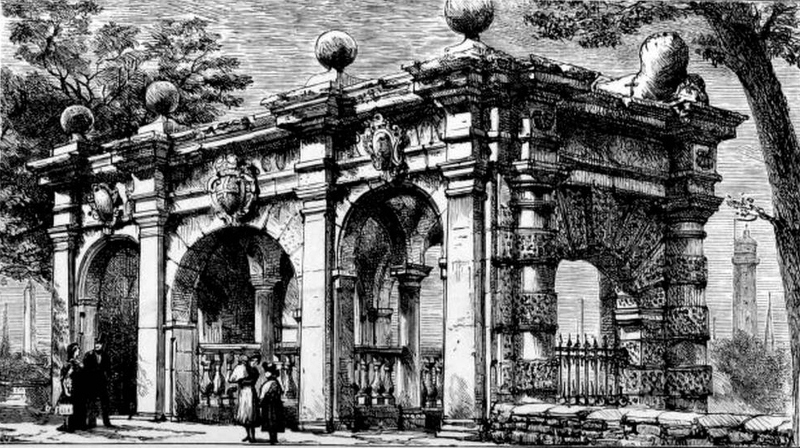 It is a pity this gate could not have been re-erected somewhere; for it is an admirable design, and the statues of raving and melancholy madness, though not the kind of decoration for an asylum which our kindlier treatment of lunacy finds appropriate, are powerful and interesting. They are preserved in the South Kensington Museum, but, having been designed for their position in the architecture, they lose their value when removed from it. Left: Figure 108. St. Catharine's College, Cambridge. Right: Figure 109. Drapers’ Almshouses, Margate. 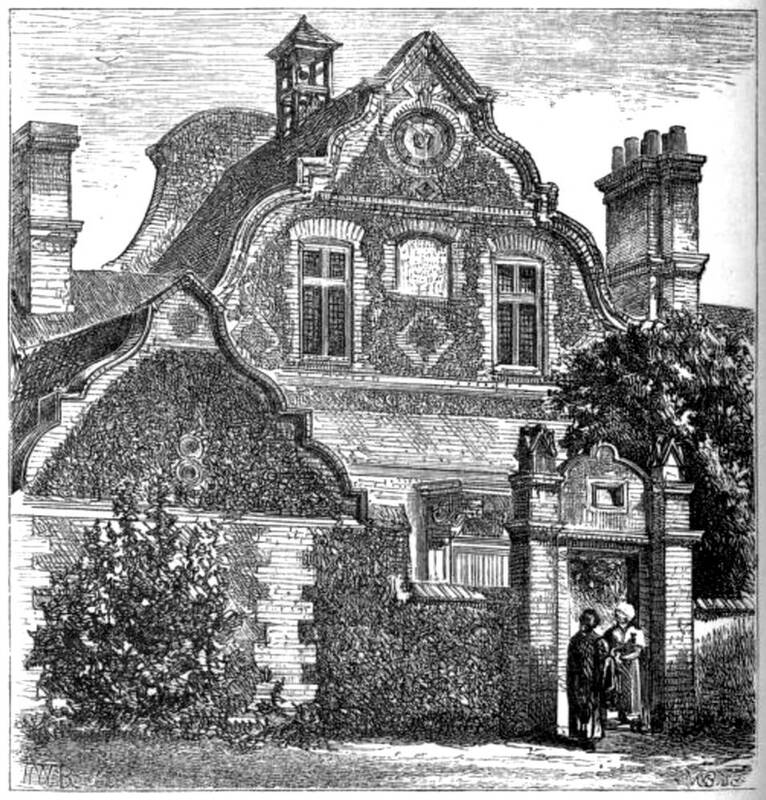 Drapers' Hospital, near Margate, belonging to the Quakers (fig. 109), is a characteristic specimen of a type of English architecture which has lately acquired notoriety under the name of "Queen Anne." Whatever may be thought of its merits, it has claim, I think, to be called a true and national style. It is a builder's, not an architect's, style, the product of traditions naturally developing themselves. At the end of the seventeenth century brick had become the common building material of the country, and Classic forms and mouldings the vernacular of the workmen, who, following apparently their own instincts, formed the style out of these elements, without drawings from architects, who were too learned to tolerate its barbarism. In this instance, though the walls are of the usual flint building of the district, all the architectural parts are in brick, the grey and red making a beautiful contrast of colour. The style is common in the villages and cottages of the neighbourhood. The shaping of the gables into various curves, which is one of the characteristics of the style, is a simple and natural and consequently cheap mode of producing an effect in brick. It is one of the many ways in which the builders in every country, still inspired by the old Gothic freedom, got rid of the trammels of Classic rule. The later Italian architects, while not daring to alter the parts and proportions of the five orders, had, especially in the Jesuit churches, striven after richness and magnificence, by broken pediments and great curved scrolls. 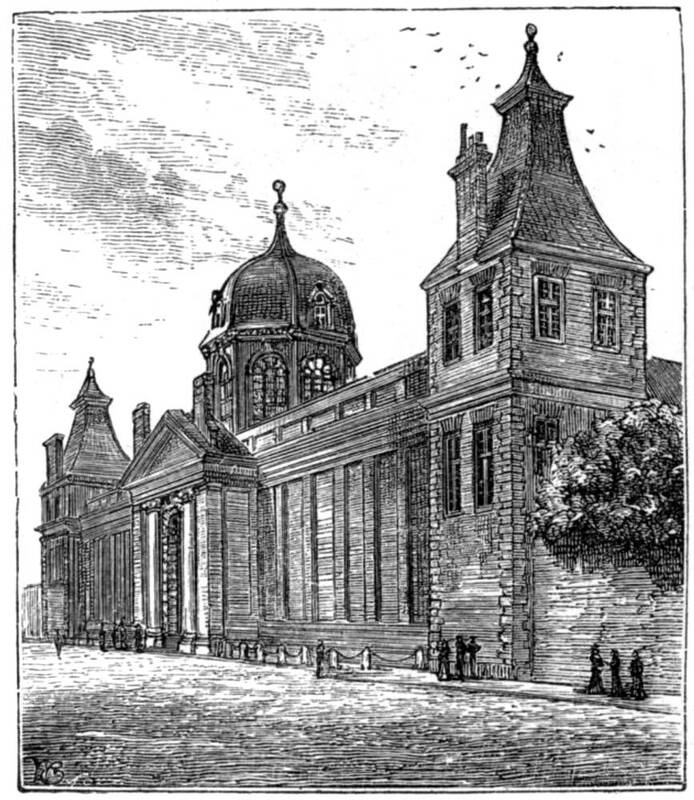 In France, in the style of Louis Quatorze, while the architecture under the dominion of orders continued correct and dull, the internal decoration revelled in a profusion of curved lines carried out into the forms of the panels and even of the window bars, where it was unconstructural and unmeaning. The same tendency to free curves shows itself in the Queen Anne style, which, though Classic in all its details, [331/332] has in it something of Gothic character. It avoids the deeply set windows and dark shadows of Classic, and gets the sense of continuous wall surface characteristic of Gothic by keeping the window frames flush with the walls, and making them part of the wall surface by covering them with thick sash bars. In this instance the windows are even more Gothic with their mullions and transoms and leaded lights. This Gothic character seems to have impressed some architect, who has lately had this building through his hands, for, since this drawing was made, he has attempted to improve it by alterations in the Gothic taste. The Gothic canopied tops to the gate-piers show the commencement of his work. He has spoilt its character by traceried windows and the earthly vanity of shields for coats of arms, thinking these, I suppose, suitable historical adjuncts of an old Quaker establishment. 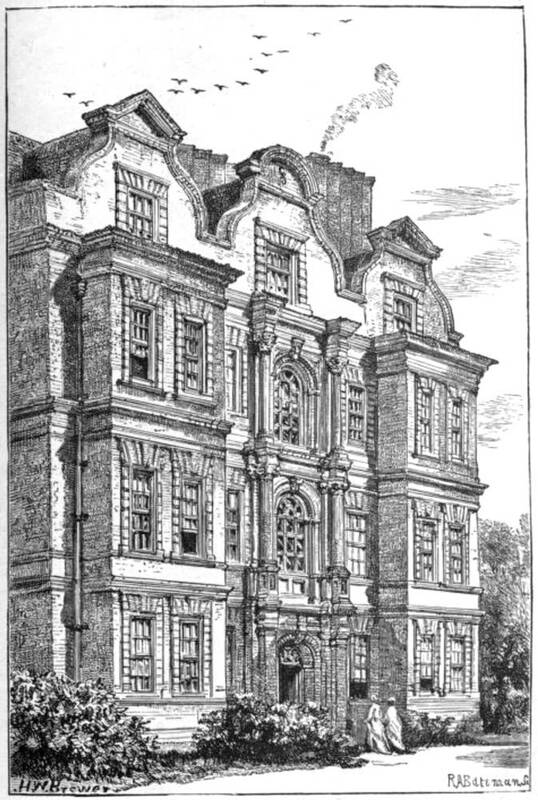 Kew Palace (fig. 110) is a more elaborate and architectural example of the Queen Anne style. It is probably not the work of an architect, else it would have been more correct, but one of those productions of a builder which were denounced by persons of taste and knowledge as aberrations from the standard of Classic purity. The orders are incorrect, and even clumsy. There is no Classic precedent for the curved gables of the roof; but it is a charming house, homely and yet dignified, built to live in, but yet pleasant to look on. The two houses at Olney (fig. 111), in one of which the poet Cowper lived, have an air of neglect and squalor which make them less pleasant examples of the style. They date probably from early in the last century, the aprons under the windows being a common characteristic in Queen Anne's time. Though this and the key-stones give them some pretentious to architecture, they are probably the work of the builder of the period. [334/335] The old rectory at Redington (fig. 112) is a good example of a simpler and later form of Queen Anne architecture. Left: Figure 111. 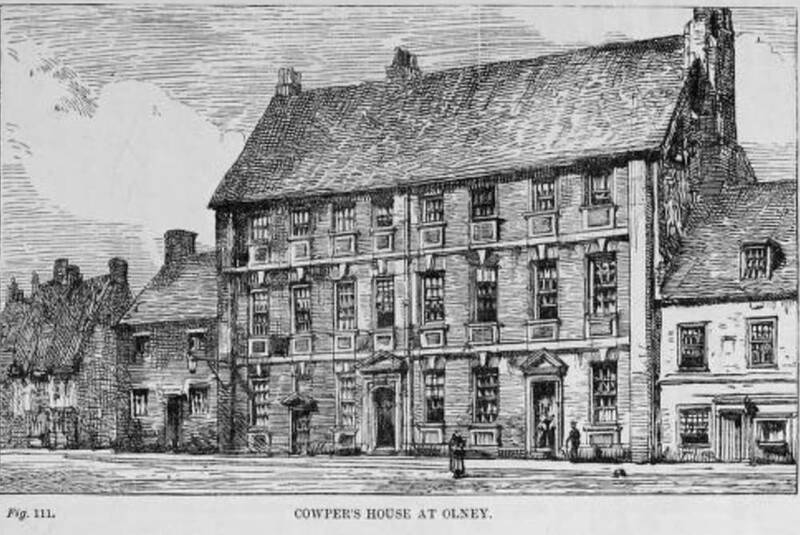 Cowper’s House at Olney. Right: Figure 112. Rectory of Redington. Such houses are common over all England. With their cheerful red brick fronts among the green, the windows [335/336] with their broad white frames and small window paries twinkling in the light, they suggest all the pleasant associations of an English home. Inside, unless where modern taste has altered them, there are pleasant parlours lined with panelling painted white; roomy, comfortable bedrooms; ample .cupboards and keeping places, and an excellent wine cellar. They do not come within the category of architectural buildings, according to our recent notions; Classic orders and Gothic ornament are alike unknown to them. They are the natural outcome of simple brick building, in an age when the work of every workman, and every moulding, however simple, was governed by traditions which secured it from offending against good taste. A notable feature of the Queen Anne style is its use ot cut brick for the mouldings and carving, which in Classic architecture are usually executed in stone. We have seen, that this was an old Roman practice. A peculiar kind of brick is used for this kind of work, called "rubbers," granular and soft, but capable, as we see from some examples of carved capitals among the old buildings of the Temple, of standing several centuries of exposure without injury. It may seem absurd and unreasonable to make up large blocks for mouldings and capitals out of such small materials as bricks, and it migbt appear better, if we cannot get stone, to mould them in large pieces of terra-cotta, as has been done with considerable success in the Albert Hall and other buildings at South Kensington. But cut brick produces a different and, I think, more charming effect. Large pieces of terra-cotta, and even moulded bricks, are apt to twist in burning, it is difficult to get their lines true, and the colour is often unsatisfactory. Yellow terra-cotta is often beautiful, but the red and the moulded bricks are usually of a livid purply hue. In cut brick work the lines are true and clean and the colour a charming orange red. During the eighteenth century the Classic style became the style of the country it was used in all kinds of buildings, domestic, civil, and ecclesiastical it developed into a national variety, and assumed a distinctively English type. By those who studied architecture and knew what Classic parity and elegance were, this process was considered mere degradation. The mouldings were not always given their proper parts and contours. The authorised proportions of the orders were not observed. English workmen gave the style a character in accordance with their own nature and common sense. Left: Figure 113. Town Hall, South Shields. Right: Figure 114. Custom House, King's Lynn. 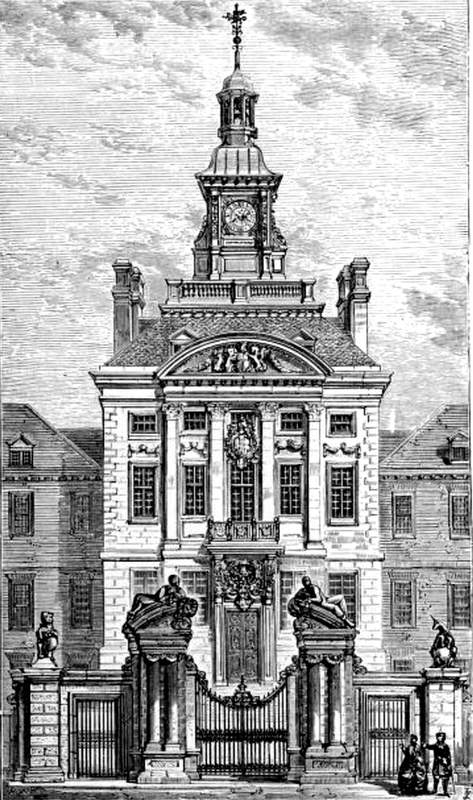 The Town Hall in the centre of the large market place of South Shields on the Tyne (fig. 113), a place which never advanced any pretensions to being aesthetic, is a fair specimen of this common English style. It has no pretensions to elegance; it is plain and even somewhat clumsy, but it is not without picturesqueness, and is an eminently common sense building The architecture is purely and naturally constructive; it has forgotten the orders &nd their proportions, it thinks for itself. Mr. Fergusson might [337/338] think it ugly or beneath notice, but he could not criticise it as slavishly carrying out the rules of Classic, or using the unconstructional ornament of pilasters. 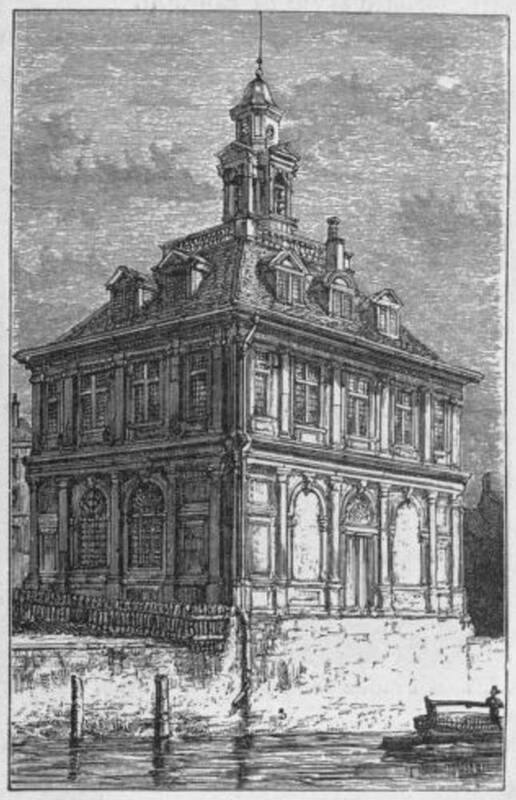 It is interesting to compare it with another building, the Custom House at King's Lynn (fig. 114), of similar form and design, but of much greater beauty and elegance, of higher architec tural pretensions, and more in accordance with Classi< rule. In the lower story we have the Classic arrangement oi filling in the space formed by the Greek column and architrave with the Eoman arch, which is certainly less logi< than the simple arcade in the Shields building. In the upper story Gothic influence appears in the similar space [338/339] being filled in with a mullioned window. Over the entrance is a statue of Charles II., in whose reign the building was erected. The general treatment recalls the Arundel Museum at Oxford, and the buildings of the later style of Francis I. in France. The gradual progression towards greater simplicity in the English Renaissance, which can be traced especially in more ordinary buildings, was occasionally interrupted by the greater learning and better knowledge of some architect or even by the introduction of a foreign style. Figure 115. Montague House — the old British Museum. The screen of Montague House, the old British Museum (fig. 115), is obviously French in its architecture. It occupied the site of the present high railing which dwarfs the height of its Grecian successor, and shuts it up in a cage. This French character, shown specially in the tall slated roofs, is due to its architect having been a Frenchman, Peter Paget, of Marseilles. The fashion of these tall French roofs never took root in England till lately, in consequence, I believe, of the Gothic revival. This English Eenaissance style, to which accident has given the name of Queen Anne, but which commenced before her reign, and continued long after it, became the characteristic style of London. The Great Fire destroyed old London with its "post and pan" houses of wood and plaster, whitewashed every three years; which had in old times given it the name of the White Town. That terrible lesson made peremptory the orders which had been frequently passed, but little observed, since the time of James I., that all houses should be of brick. London in its enormous growth, which began after the Restoration and has continued ever since, spread itself over the country, and absorbed outlying villages and towns. All the houses were built in the new style, which applied the rules of Classic, as far as they would conveniently go, to building in brick. This style continued in a process of natural change and growth till the time of George IV. At first it retained something of Gothic pictures'queness, as appears in the old street (fig. 116), now destroyed, which [340/341] led from the Strand to the river, near Waterloo Bridge. The narrow windows, at the corner of the house to the right, show a common feature of the style, due to the old Gothic ideas still influencing the builders, quite at variance with the Classic rule that all windows in a row should be equidistant and of equal size irrespective of the size of the apartment which they lit. Figure 116. Old Street in London. Gradually the style became more correct. The windows were made uniform, not only in the same house, but in the whole row. As the houses were built by the yard for sale, there was no reason for making one different from another. 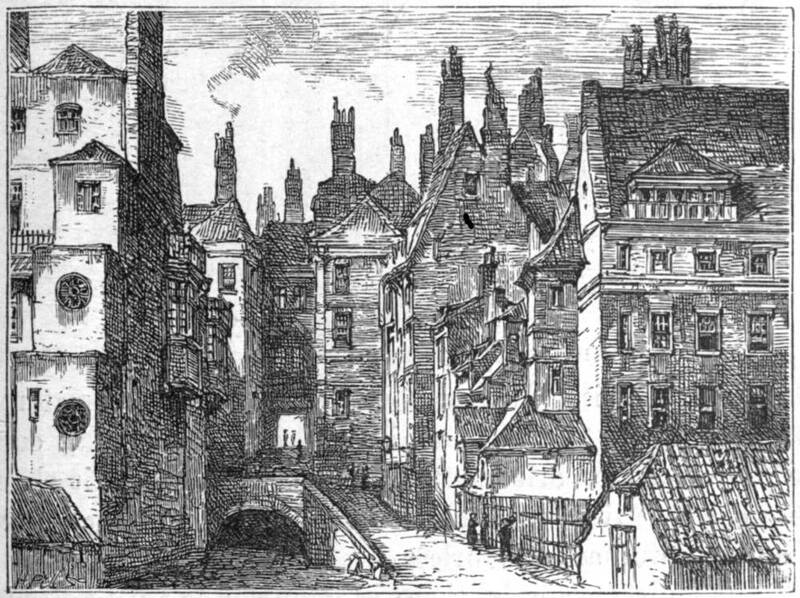 They lost their individuality, and the process was encouraged by the foolish building conditions of ground landlords, insisting that streets should be built uniform, according to an elevation which they furnished; so that in time the style was degraded to the dreary uniformity of Gower Street. Yet it is a true style, correct and in harmony, to the smallest particular. Every moulding is right in its own [341/342] way, and tells its place and date in the gradual progress. It avoided bad taste. The highest compliment that could be paid to art or ornament in that age, was that it should be "chaste," till architecture in fear of offending became absolutely dull and colourless. In its dullest examples there is character and even dignity, as in the tall wrought-iron railings, the delicate balconies, and especially the entrance doors, on which was concentrated what little architectural ornament was expended on each house. These doorways were different in every house, giving each house individuality, notwithstanding the general sameness of the street and they were beautiful, sometimes even noble examples of design. In this respect these houses were better than those of our builders, which are ornamented all over with stucco only, it is true but [342/343] all in the row absolutely alike, so that a man knows his own house only by the number on the door. Figures 117 and 118. Doorways in Essex Street, Strand. 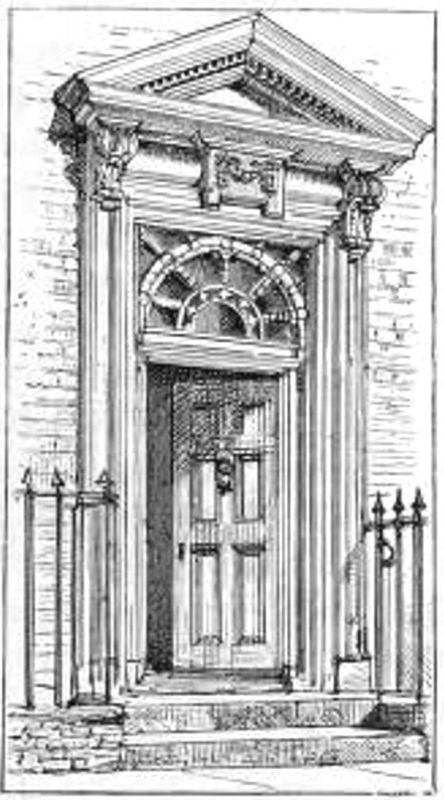 Of these doors I give three specimens, all from one little street, Cecil Street, Strand. They date from early in the eighteenth century, and very fairly illustrate the general character (figs. 117, 118, 119). Figure 119. Doorway in Essex Street, Strand. Except in some few more magnificent examples, these doorways in the old houses are always made of wood. This is forbidden now, by the London Building Act; somewhat needlessly, I think; the danger of their spreading fire not being obvious. The joiner work in the style, as in the internal fittings, is generally architectural, and more Classic than the brick and stone building. A universal feature in all these doors is the window above, lighting the passage, filled with delicate wooden tracery; always of playful and pretty design, and in many cases showing [343/344] marvellous examples of delicate wood-work. These windows are part of the architecture of the door, and essential to its beauty. By a rule of the Portman estate, before a new lease was granted by the ground landlord, the tenant was compelled to improve the property, by clearing out this tracery and substituting a single sheet of plate glass a curious instance of stupid destructiveness. But the street architecture of the style was governed, to an extent Lord Bacon never meant, by his maxim that "houses are built to live in, not to look on." With the exception of the doorways (and when the style was dying out in the beginning of the century, no trouble was taken even with them), the fronts were absolutely plain. In the interiors neither trouble nor expense is spared in the design and ornament. The ceilings are covered with delicately moulded plaster ornaments of leaves and sprays, and figures, specially designed for each room. The chimney-pieces are of marble inlaid in different colours, and excellently carved. The doors are of solid mahogany, the panel mouldings carved with egg and tongue, the architraves and cappings painted white like the other wood-work of the room, which brings out the contour of the mouldings. Every room is designed and treated architecturally, with a panelled surbase or dado round it, which was seen through the open carved backs of the chairs, and with an enriched and wellproportioned frieze and cornice. People cared more for these things then than they do now. They gave them thought and care, and spent their money on them. It was easier then than now to get them well-designed and all in keeping; for the style was a living one, understood by every workman, who worked as he had been trained, in harmony with his fellows. Some designers may have been better than others; acknowledged as masters of the style and setting new fashions, like the Brothers Adam. But the [343/344] work which is not theirs is similar in style, and they could not have carried out the work they are credited with, all over the three kingdoms, so completely, unless the style had been everywhere familiar to the workmen. There are still in London many such interiors as I have described, some turned to base uses, in districts now unfashionable, while others, alas! 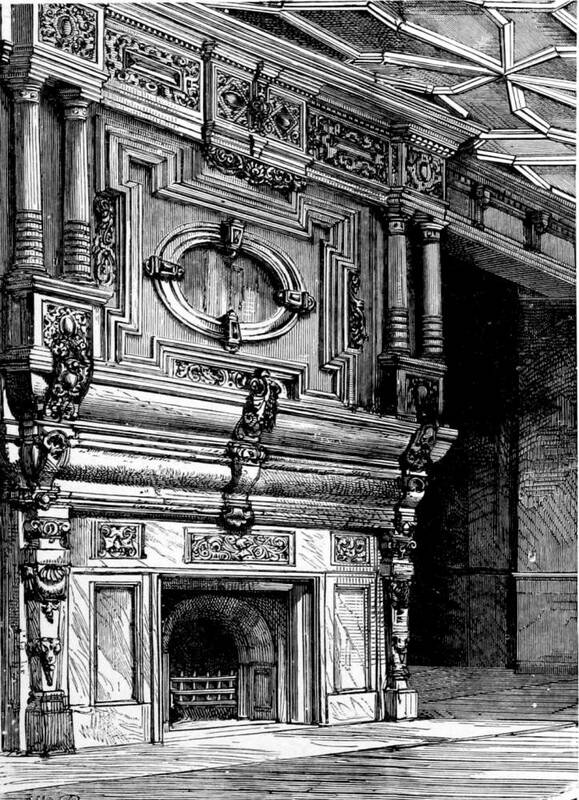 have been improved by the modern builder, surbase [sic] torn down, the delicate white marble chimneypiece replaced by one of enamelled slate, with a gigantic shelf and clumsy consoles; and a new cornice substituted, with coarse mouldings and vulgar ornament, for the old one which had been proportioned to the room. The Adam style of interior decoration has of late become fashionable again. It is chaste and elegant, but rather feeble. The same attenuated ornament is used in every position and in every material; for plaster cornices and ceilings, the mantle-pieces and fire-grates and the wood-work of doors and surbases. In the modern revival of the style the examples frequently miss one chief merit of the older work, the consistency with which it was carried out into every detail of ornament and furniture. During the Regency (1811-1819), there was a revival of street architecture; a part of that general awakening from eighteenth century dulness, which the French Revolution everywhere caused. By this time G-reek architecture, which Stuart and Revett had discovered, had come to be understood, and was perceived to be different in principle and form from the Roman, with which, since the Renaissance, it had been supposed to be identical. It was seen to be more refined and beautiful; that it rejected the use of the arch, and of brick as a building material, and used great stone lintels as the only means of spanning openings. People had become tired of the meanness to which brick architecture had degenerated, and the wilderness of grey stocks which London had become. But stone, especially of the dimensions [345/346 ] which Greek architecture required, was impossible in London houses; but the appearance of it could be got by stucco, for which there is Roman and even Greek authority. The brightness of the new white buildings charmed every one; and if, in looking at examples of them (such as the terraces round the Regent's Park or on the cliffs of Brighton, which were among the first fruits of the movement), we can divest ourselves for the moment of our present ideas and forget that they are shams, we must admit that they exhibit something of the brightness, and even of the grandeur of Classic architecture. The builders, as usual, followed the fashion, and carried out the new style, in their rows of houses, in worse architecture and meaner design. Ground landlords, in letting their land for building, insisted on its adoption in the new streets, and for the next thirty or forty years it was the common London style. One element of grandeur was sought for by designing a row of houses as if it were one single great building, with a great pediment in the centre and symmetrical wings on each side flanked by propyloea. This grand design was apportioned equally among the several houses, the division giving perhaps to one house two windows out of the wings, and another under a corner of the pediment. To prevent this absurdity being apparent, which would have spoiled the effect of the architecture, a clause was inserted in each lease that the owners should all use the same colour in painting their houses. But the workman was not always successful in matching the colour, or the houses being painted in different years the various degrees of dirtiness made the deception obvious. This palatial style was carried out with better effect in the squares and crescents of Edinburgh, which were built about the same time. Greek architecture was studied there with enthusiasm, and reproduced with knowledge and invention in adapting it to modern use. The splendid quarries [346/347] of Craigleith furnished blocks of stone large enough for the columns and lintels of an order occupying the height of two stories. The result, as in Moray Place, has nothing of the meanness which their material gives to the London examples, but there is an air of gloomy aristocratic grandeur which the present age has found depressing. Even here a difference in the colour of the window-blinds exposed the deception of the design. Internally the requirements of the architecture were inconvenient, restricting the apparent number of stories, and making the windows of the upper floors look out on a gutter and blank parapet wall in order to conceal them. In London, the brightness of the clean white-painted fronts of the new architecture was an improvement on the dinginess of the mean fronts of grey stock bricks. But the obligation on the owners to paint the outside of their houses once in every three years (for which there was precedent in a similar rule in old white-washed London) was found onerous. The stucco or cement occasionally fell off in great flakes, and was expensive to repair. Of late the builders have got over this difficulty, still keeping the houses white, which was supposed to be the only proper colour for architecture, by facing the walls with white bricks and limiting the stucco to the architrave mouldings round the windows, the cornices, the corners, and the Classic columns of the porticos. The ingenuity of man has never produced a form of architecture more dismal and contrary to common sense; for the bricks, white at first, soon become a dirty grey, like dirty linen; and the meaning of architraves and cornices in architecture is, that being the exposed parts, they should be of harder and better materials than the walls of the building. But stucco is meaner than brick, and more easily chipped. The right arrangement of the materials would be to cover the walls with stucco, where it is useful to keep out the damp, and to make the corners 347/348] and cornices of brick or stone. Some noble buildings, like the Palace of the Uffizzi, at Florence, have been designed on this principle. The Gothic revival of the last twenty years, though a whole generation of architects have been trained in it and practised it, has had no appreciable influence on street architecture. The builders would not risk building Gothic houses for sale, and, I think they were right. Artistic publicans have occasionally adopted it for public-houses; but the result has not been gratifying to the lovers of the style. Within the last year or two there has been a revival of the "Queen Anne" style for town houses, and even for streets. The fashion seems to be spreading. It has received some accession of force from the schools of the London School Board, planted in every district of London, having been mostly built in that style. For the architecture of a few of the earliest of these I am responsible, having found by the practical experience of a house I built for myself in this manner, that the style adapts itself to every modern necessity and convenience. In that case I made no attempt to follow any particular style, the style grew naturally from using the ordinary materials and modes of work, and trying to give them character and interest. It is as pliable as Gothic, having inherited its freedom. Large windows or small, wide or narrow, with mullions or without them, arched or square-headed, with sliding sashes or hinged casements, with sash-bars or leaded glazing may be used in it as convenience or fancy dictates. Though some of its forms are adapted for stone, it is properly a brick style, and therefore specially suited for London houses. Ground landlords have favoured it and encouraged its adoption, insisting that the new houses on their estates should be built in red brick. But red brickis by no means essential. Great masses of it, especially [348/349] when pointed with black mortar which gives the building a purple hue, almost hurt the eyes with their glare. Pleasant colour, I think, is got by dark brown stock bricks for the walls, and red bricks for the angles and cornices. The addition of black completes the harmony. But there is no need to use black bricks for the purpose, as the London atmosphere may be trusted to supply it. The black does not give an impression of dirt, for it is not, as Lord Palmerston defined dirt: " Matter in the wrong place," and an effect of cleanness and brightness is given to the building by the white window frames and sash-bars, which can be re-painted at trifling cost, their whole surface being small. It is a first condition of good architecture that the building should weather well, that the effects on it of the atmosphere it is placed in should improve rather than spoil it. It should be like a part of its natural surroundings. Weather-worn stones, moss and grey lichens give many an old building a beauty which it had not when first built, and which it loses when it is restored. Even in towns, where smoke kills the lichens, it is possible to design so that it shall improve the building. St. Paul's is grander in the rich black of its base and the more than marble whiteness into which the weather has bleached it where it towers above the houses than it can have been when fresh and new. Polished granite or marble is soon dimmed and looks dirty. To keep them right they should be cleaned as often as the windows, which is impossible. For human nature's daily food." Bibliographical note to page 313: Parentalia: or, Memoirs of the Family of the Wrens; viz., of Mathew Bishop of Ely, Christopher Dean of Windsor, &c., but chiefly of Sir Christopher Wren, late Surveyor-General of the Royal Buildings, President of the Royal Society, &c. &c. In which is contained, besides his Works, A great number of Original Papers and Records; on Religion, Poloticks, Anatomy, Mathematicks, Architecture, Antiquities; and most branches of Polite Literature. Compiled by his Son Christopher; now published by his Grandson, Stephen Wren, Esq. ; with the care of Joseph Ames, F.R.S., and Secretary to the Society of Antiquaries, London. London. Printed for T. Osborn, in Gray's-Inn; and E. Dodsley, in Pall-Mall. MDCCL. Stevenson, J. J. House Architecture. 2 vols. London: Macmillan, 1880.